A video purporting to show "Muslims" thrown out of a cinema hall for not standing for the national anthem has begun a debate on patriotism in India. The video, which has since been taken off YouTube, shows a crowd shouting at a group of people who remain seated during the Indian anthem. It is unclear where the incident occurred, although some reports said it took place in the city of Mumbai. The controversy comes amid a debate on "growing intolerance" in India. National anthem has been trending on Twitter India, with opinion sharply divided on the actions of the crowd. Many have supported the theatre audience, calling the actions of the group "shameless" and "blasphemy". However, some others have questioned the need to "wear patriotism on your sleeve" and the relevance of token gestures like simply standing for a national anthem. 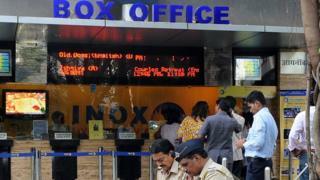 Though not all cinemas in India play the national anthem before screening movies, it is mandatory in some states, including the western state of Maharashtra. Cinemas in the state display messages asking audiences to stand before playing the anthem. This is also not the first time that people have been targeted for not "respecting" the national song. Last year, a man was beaten by a mob in Mumbai, after his South African friend refused to stand for the national anthem. The man, identified as Mahek Vyas, also alleged that a policeman at a nearby station had refused to file a complaint against the six people who attacked him, and had also told him that he should have made his friend stand. In the southern state of Kerala, a man was charged with sedition after he refused to stand for the anthem in a cinema. Bollywood actress Preity Zinta was also mired in controversy, after she took it upon herself to throw a boy out of a theatre hall because he refused to stand for the national anthem. Although there is no specific law that mandates standing for the anthem in India, the home ministry's rules, which carry the force of law, specify that it is compulsory to stand to attention when the anthem is played. The debate about India's national anthem comes amid concerns over growing intolerance in the country.